You might have noticed that things look a little different around here. Scratch that, A LOT different. Welcome to our newly-redesigned website, created with you, the customer, at the very center. The first of many changes are now live, so we’d like to show you around. New navigation: Our main navigation has been re-organized and simplified with easy-to-use menu cards. You’ll find categories for Wine, Gifts and Discover (more on that one later). 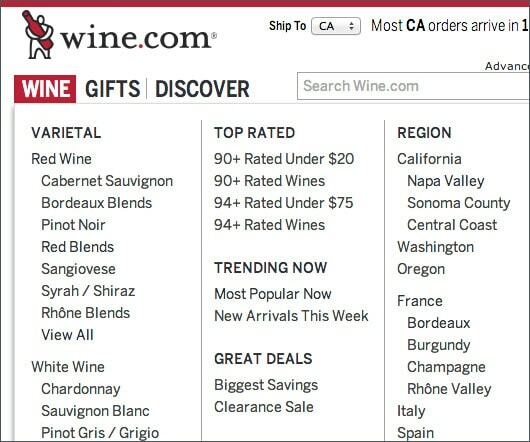 Categories like regions, varietals, and popular lists are now right there to see. New expandable/collapse-able categories on the left side of every search page: Whether you’re shopping by price, vintage, region, or…anything really, there are now more ways than ever to narrow down to your desired list. New gift categories: We re-organized our massive gift assortment into categories that make more sense, to help you find the right gift, for the right occasion, at the right price. Popular gift categories are easily accessible through our re-designed menu card in the website’s top navigation. Our new look better captures our excitement for great wine. Whether you’re toasting major milestones or relaxing with friends on the weekend, wine represents the shared moments and memories of our daily lives. To reflect that, we added a few key touches to the website. 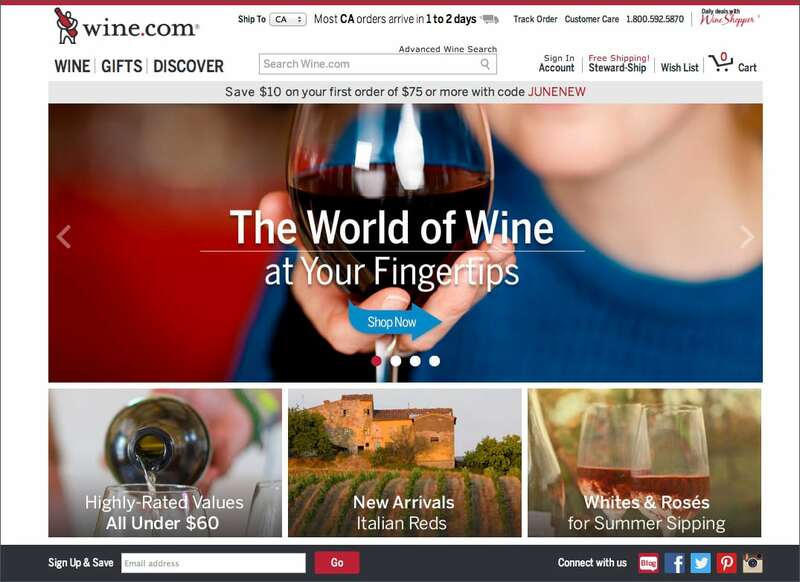 Remodeled homepage: Our goal is to help you better enjoy wine by providing a broad selection of great choices, offering help and advice when you need it and making shipping and delivery free and convenient for our customers. Those messages are now beautifully displayed right up front, where it counts. Brilliant photography: You’ll notice that category pages are now topped by images showcasing the real vineyards, regions, and varietals that go into each wine. 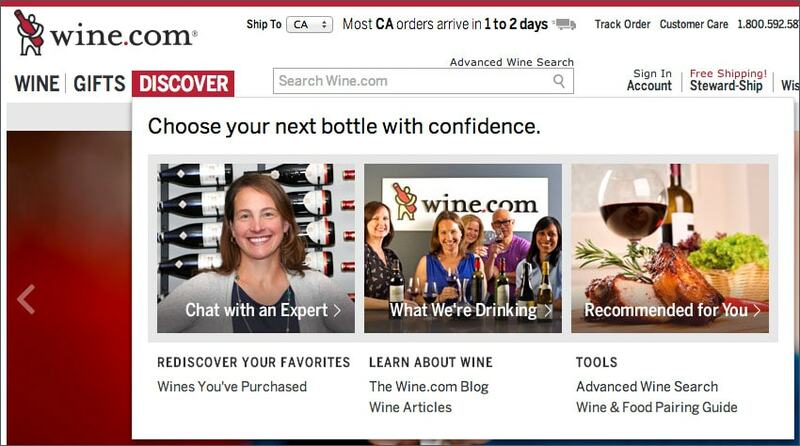 Live chat: Real-time, convenient help from a wine expert during business hours. Easy-to-browse lists of wines recommended by our staff. Quick suggestions on wines you might like based on your past purchases. These are just a few of the upgrades we’ve made to the Wine.com website. We’re always looking to improve the customer experience, so please check out the new site and let us know your feedback. Many more exciting changes are in the works. Stay tuned and until then, Cheers from the Wine.com Team!